We use PayPal for your security and convenience. Prices are current as of January 2015. 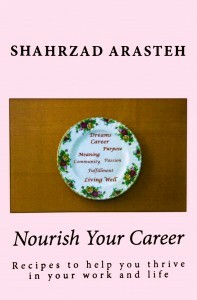 Nourish Your Career Recipes to help you thrive in your work and life. I wrote this book to share tips on job searching effectively, creating a career that fits your life and goals, thoughtfully managing your career, and finding ways to nourish your career, and your life. In it, I’ve also included top career tips and delicious recipes from 17 of my favorite career colleagues and friends! Join us for a visit around my (virtual) table. Get your copy ($19.95). 20-minute Consult There are times when you are struggling with a very specific area or need feedback on one particular aspect of your career, job search, or business – maybe not enough to ​require ongoing coaching, but enough to get in the way of your career success or slow down your progress. If so, this is an opportunity to bring your one specific question and get feedback and solutions to help you move forward with confidence. Get more information and book you mini-career session here. Nourish Your Career Inner Circle™ – Based on the Nourish Your Career philosophy, advice and tips from me and 17 other professionals who contributed to the book, this is a small group focused on helping you clarify, explore, and reach your goals. If you’re ready to work together on job searching effectively, creating a career that fits your life and goals, consciously managing your career, and finding ways to nourish your career, and your life – and having fun along the way – join the Nourish Your Career Inner Circle™! *Bonus: You can join us from your preferred location, without having to go anywhere! Learn more. Not sure which of these may be the best fit? Call or email me and let’s find out – (410) 271-5815.